Genevieve is a serial entrepreneur turned venture capitalist with a background in building and growing early stage companies in various roles and industries, and in early stage venture capital and fund formation. She is the founder of the XXcelerate Fund, a loan-based fund and 12 month education accelerator program focused on women-led start-ups and is General Partner and Principal of FoundersPad Fund II. For Fund II, FoundersPad will be a female-led venture capital fund. Her functional expertise is in sales, growth strategy, demand generation and marketing strategy and she advises and coaches early stage entrepreneurs on how to effectively and efficiently raise growth financing and to kickstart the initial sales traction that is required to get there. Genevieve has an MBA from UW Foster School of Business (2012), an undergraduate degree in Communications (Broadcast Journalism & PR) from WSU Edward R. Murrow School of Communication, and a minor in Political Science (2005). She currently serves as Vice President of the Board of the XXCelerate Fund where she leads revenue generation education, and is on the board for the Oregon and Southwest Washington Council for the Girl Scouts which serves as a strong pipeline for girls in STEM education. For additional information about working with me, visit my website. For inquiries about FoundersPad, please visit our website. Are you an entrepreneur who is ready to take your product to the world and crush your initial sales goals...but you're not really a sales person? If so, this course was created for you. Sales is the lifeblood of your company, and if you want to be a successful founder and CEO, you've got to learn the ropes. Which means You are your company's first sales person. Before you go running for the hills, hear me out. If you want to raise money from investors, you've got to make money to raise money. Traction means real customers paying actual money for your product, and real growth that is consistent month in and month out. Investors will not fund you so that you can go figure out how to get sales. They want to see that you have at least a basic system in place to target and prospect to your ideal customers, generate leads, and convert these leads into customers. If you can raise money, go for it. But customers can give you money now, and you don't have to pay them back. But if you're more interested in raising a future round successfully, on great terms and without getting screwed over, a sustainable, repeatable sales process and a healthy sales pipeline that is generating consistent revenue for your business is the way to go. 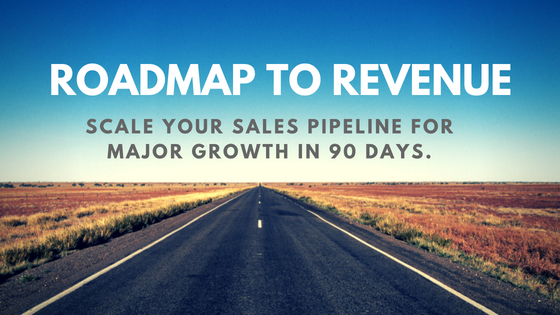 You probably already know that the key to closing your first round is real Traction. Real traction is not Letters of Intent (LOI), people telling you they think you have a good idea, or people using your product for free. Real traction is real revenue, which will allow you the FREEDOM and CHOICES to raise on better terms (or not raise at all), not have to race against the clock by extending your burn rate, pay yourself and your team more, and ultimately build the company that you envision, not your investors. Scale your business to true profitability and everybody will want in.